Freezer burn looks like dry, leathery, and sometimes pale patches in various areas of frozen foods. On bread and buns, it looks more like dry, hard sections, usually more on the outer edges. Freezer burn does not make frozen foods unsafe to eat. However, it does make them unpleasant or difficult to eat as food quality has severely deteriorated. There's also often an unpleasant freezer odor that accompanies freezer burn. You can often trim off freezer burn to save a good portion of the meat, but when freezer burn is extensive, discarding may be your only choice. There is no harm leaving the freezer burn areas on foods during cooking, but those areas are more difficult to remove later and will affect overall taste and texture. Why Does Freezer Burn Occur? Freezer burn occurs in any type of freezer and is the result of inadequate wrapping and air being trapped within robbing it of moisture, creating the dry hard areas. Even if you have removed air trapped inside, it also occurs when (air) is allowed to enter the bag or storage containers due to an inadequate seal. With bread and buns, the thin and loose shelf packaging you bought them in is inadequate for freezing and also allows condensation which in turn, leaves some of the bread soggy, as well as hard and crusty. The longer the foods are stored in the freezer, the worst the freezer burn and some foods are affected sooner than others. 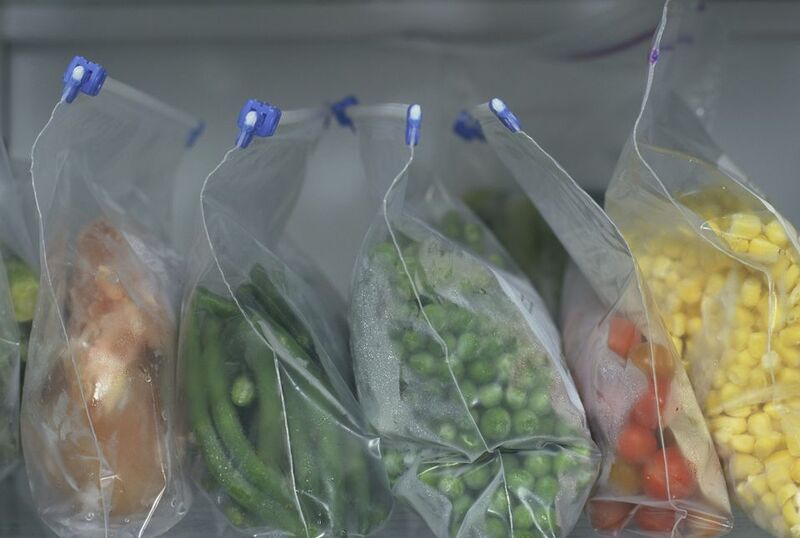 To avoid freezer burn, foods should be wrapped properly and as much air as possible should be removed from the bag or container. In addition, freezer foods should be consumed as soon as possible. Remove as much air as possible from the freezer bag or container. A vacuum sealing system is the best, but any method that draws out air will provide at least some protection from freezer burn. Use only bags and containers designed for freezing food and that are deemed to be food safe (not all plastics are). Avoid freezing with flimsy store bagging such as that found on bread, buns. Food wrap in itself does not provide any protection. Double or triple wrap prepackaged food items. When using butcher-style wrapping paper, the waxed side should be on the inside and also insert the wrapped food into a zip-style freezer bag to further protect the contents. Rotate freezer foods to use the oldest first. Always label freezer foods with a date, so you can more readily use it within the recommended freezer lifetime. While inadequate packaging and extended freezer life are the main causes of freezer burn, the style of​ the freezer can also make frozen foods more susceptible. A self-defrost freezer cycles on/off to keep the interior of the freezer frost free. This fluctuation in temperature, though it does not cause foods to defrost, does make freezer foods more prone to quicker freezer burn. You should also avoid extended browsing (freezer door open), which also causes temperatures to fluctuate. For this reason, you should store frozen foods intended for longer freezer storage, in a manual defrost freezer, which provides better protection. And keep mainly short-term frozen foods in the refrigerator freezer, or in a self-defrost upright freezer.